A modern winter fotmuff with cosy microteddy inlay and practical bags at the front. A modern winter fotmuff with cosy microteddy inlay and practical bags at the front. Made in Germany. An exclusive from Odenwälder BabyNest. The material offers all the usual advantages of Odenwälder winter footmuffs. it's 100% windproof and highly breathable. 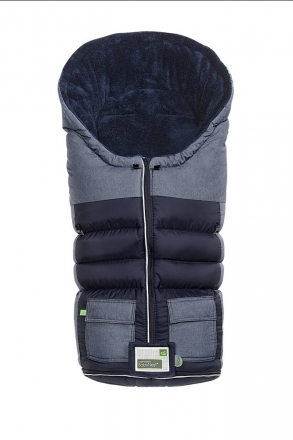 - the weight of the footmuff can be varied in two stages using the adjustable zipper. This means it is also great for bigger infants and adjusts to their clothing as well. - The fibre balls are ideally suited to allergy sufferers. - The footmuff is equipped with a water-repllent material on its outside and can be easily cleaned. The footmuff is also coated internally in its foot area which means that the traces of many adventures can very easy be removed. With the left side up: wash, skid well and dry the footmuff. Only use liquig detergend without visual brightener, no bleacher and no softener or conditioner. Only wash with similar colours. Dry it directly after the washing process. Suitable for dryers, but only by low temperatures. After drying you have to spread and bray the filling by hand.